Not to mention the fact that Rep. Matt Shea, who complains about "label-lynching," labels journalists "dirty, godless, hateful people." 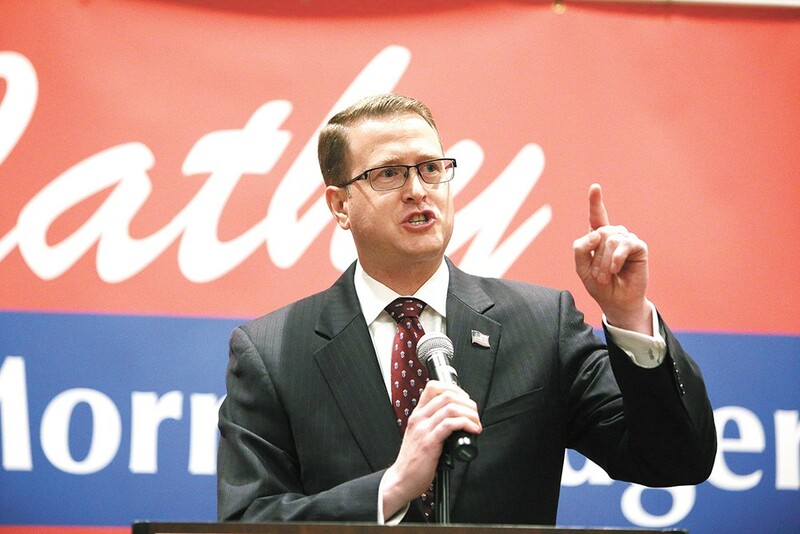 Rep. Matt Shea cares a lot about making sure that nobody claims he endorsed someone he hasn't. And yet, this election cycle, he falsely claimed that a group endorsed him when they hadn't. Indeed, according to the Spokesman-Review, when a reporter tried to interview Shea at an Aug. 5 anti-abortion rally, Shea hit back at the reporter, accusing the paper's reporters of falsely claiming he had endorsed someone other than Rep. Cathy McMorris Rodgers. In fact, Spokesman-Review reporters had claimed no such thing. They wrote a story about Jered Bonneau that noted he would be seeking Matt Shea's endorsement. The Spokesman-Review also published a letter to the editor from somebody from Colville claiming, incorrectly, that Bonneau had been endorsed by Shea. But Shea wouldn't return the Spokesman-Review's phone calls for comment requests about endorsements and Shea never complained about the letter to the paper directly. Shea put out a screenshot of an email from his campaign complaining about the letter — but that went to non-existent email address. (Bashing reporters because a letter to the editor got something wrong is a little like arguing the New York Times is fake news because you don't like online comments.) In fact, the Spokesman-Review was the first media outlet to report that he'd decided to endorse McMorris Rodgers. But here's the thing: At that very moment he was attacking the Spokesman-Review for endorsement claims, Shea's campaign site continued to list a false endorsement. On his long list of endorsements, Shea claimed the Spokane County Deputy Sheriffs Association was endorsing him. But in response to a Facebook post on Tuesday, Kevin Richey, president of the Spokane County Deputy's Sheriffs Association, pointed out that this was blatantly false. Reached by phone, Richey says that four years earlier, the Spokane County Deputy Sheriff's Association did endorse Shea. But they didn't endorse Shea in 2016, and yet Shea's website continued to claim that they did. "The only candidate we endorsed the last election cycle was Candace Mumm," Richey says. Richey says the Deputy Sheriff's Association remained unaware that Shea was continuing to proclaim their endorsement. "I hadn't checked campaign website until Saturday," Richey says. "Someone said to me that that they were surprised we endorsed him." On Monday, Richey says, he sent the Shea campaign an email and didn't get a response. On Tuesday, Richey says he emailed Shea's personal account. "I told him if he didn’t respond I was going to file a complaint with the PDC," Richey says. "He needed to take it down." Richey says Shea agreed to take it down. But it's not the only suspect endorsement on the site. The Rental Housing Association of Washington PAC hasn't made an endorsement in Shea's race at all yet this year. "We’ve endorsed him in the past. For 2018, our PAC is not taking a position on his race," says Sean Martin, executive director of the association. "We haven’t reviewed him for this year yet." Similarly, a call to the Washington Auto Dealers PAC reveals that, while they do make financial contributions to candidates, they don't put out official endorsement lists at all. "The Credit Union Legislative Action Fund contributed $1,000 approximately one year ago, towards the 2018 primary election," says Lynn Heider, vice president of public affairs for the Northwest Credit Union Association. "This contribution did not and does not constitute an endorsement, and CULAF did not contribute to Shea’s upcoming general election campaign." (The spokesman of the Washington State Veterinary Medical Association made a similar claim. Richey says that the Deputy Sheriff's Association decided last year not to make any political endorsements going forward. The Janus Supreme Court decision this year means that public sector unions can't force employees to pay union dues. Richey says the union hopes that if they can show that they're nonpolitical, they'll still be supported. "As an organization, we feel like if we step back from politics maybe it will alleviate some of those concerns," Richey says. In Washington state law, it is considered libel or defamation for a person to sponsor a "political advertising or an electioneering communication that makes either directly or indirectly, a false claim stating or implying the support or endorsement of any person or organization when in fact the candidate does not have such support or endorsement." However, that law only applies to statements made about candidates other than yourself. Because, legally, you can't defame yourself, the legal restriction doesn't apply. Either way, the falsehood would have to meet the "actual malice" standard, which is fairly high: The person would have had to have known that the endorsement claim was false, or have shown "reckless disregard for the truth" for it to be illegal. "I don't think he did it with malice," Richey says. "It was probably a mistake." Most likely, Richey acknowledges, Shea simply left the endorsement from 2014 up and hadn't bothered to check if the group was still endorsing him. "However, most candidates review their endorsees and get re-endorsements every campaign cycle," Richey says. "You're supposed to." Still, sometimes people make mistakes. That's not only true about journalists and letter-to-the-editor writers — it's true about Spokane Valley politicians as well. Shea, who long ago blocked most Inlander reporters — and occasionally their significant others — on Facebook and Twitter, did not immediately respond to a request for comment. He has not in a very long time.